The history of modern Freemasonry goes back 300 years, to the formation of the first or Premiere Grand Lodge of England in 1717. Freemasonry had existed for many hundreds of years prior to that date, in various forms and locations, but this was the first time that a central body had been created to organise the Fraternity in this country. That first Grand Lodge of England was started by four London Lodges who met at the Goose and Gridiron pub behind St Pauls Cathedral for the founding meeting. By 1724 an additional 23 Lodges had either joined or been formed, all in London. The next Lodge to be created was number 28. It was the first in history to be formed under the banner of Grand Lodge anywhere outside of the capital; and it met at the Queens Head in Cheap Street here in Bath. 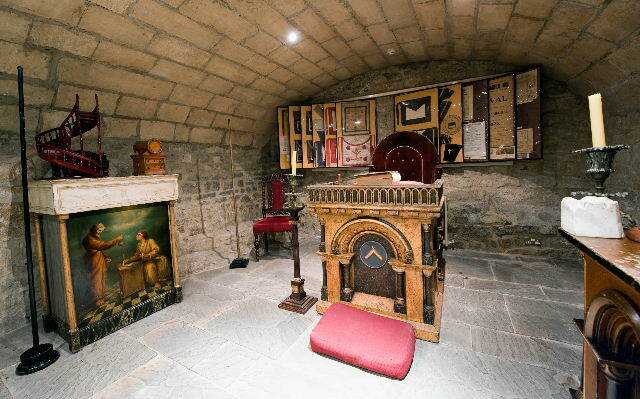 So it is fair to say that Bath is the oldest provincial centre for Freemasonry in the country, and that local connection with the Fraternity has been maintained constantly from that date in history right up to the present day. The Queen’s Head Lodge had a very prestigious membership, including no less than six Dukes and Earls, five Fellows of the Royal Society plus numerous Baronets, all of whom were existing Freemasons from London who came regularly to the City to take the waters. The remainder of the founding 42 members were made up of local luminaries, including the City’s Master of Ceremonies Beau Nash and six gentlemen who either had been, or would go on to be, Mayors of the City. The Queen’s Head Lodge only survived for around ten years, disappearing in 1735, but in the meantime another Lodge had formed in 1732 next door at the Bear Inn. 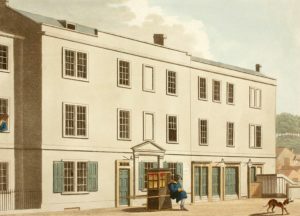 Eighteenth century Lodges almost exclusively met in hostelries – converted or purpose-built Masonic Halls being very much a creation of the next century. This arrangement was primarily dictated by the incorporation of dining, known as the ‘Festive Board’ within the Masonic evening, and it was, therefore, convenient to meet in an establishment that was able to provide catering facilities. This second Lodge, number 113 on the national roll and originally called The Bear & Collar Lodge, is the oldest Lodge in Somerset and still meets here to this day as the Royal Cumberland Lodge, having been renamed in 1786. It holds it’s full and complete records from the date of the first meeting on 27th December 1732, including minutes, account books and correspondence. Among the many distinctions it has achieved in the intervening 285 years, one of the earliest was when it was famously attended on October 30th 1738 by the then Prince of Wales, Prince Frederick Louis, on the occasion of his birthday. 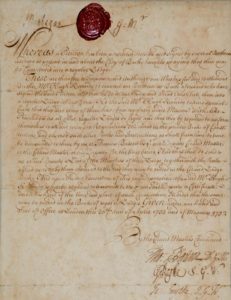 There is also evidence that other degrees were being worked in the Lodge during the 1740s, including mention of a Mark Degree, and a specific minute in 1747 of an extraordinary meeting being convened where “Thomas Naish and John Burge were this day made Scotch Masters and paid for making 2s. 6d. each. Bro. Thomas Rogers was this day made an English Master and paid for the making 5s.” It is believed these are early references to what would become the Rose Croix. For a period of sixty years from 1751, a rival Grand Lodge of England existed terming themselves the ‘Antients’, the existing Premiere Grand Lodge becoming known as the ‘Moderns’. These two kept their own Lodge rolls with separate numbering systems, and were eventually combined in 1813 as the United Grand Lodge of England, the body under whose jurisdiction all Masonic Lodges meet today. Freemasonry in Bath during those sixty years was almost exclusively under the ‘Moderns’ banner, but in 1762 an Antients Lodge number 100 was formed at the Shakespeare’s Head in Westgate Street. It lasted barely a year, but in 1765, the Lodge of Perfect Friendship number 348 was formed, also at The Shakespeare’s Head, but under the Moderns’ banner. The 1760s were a period of great activity in the local Fraternity: in 1768 The Provincial Grand Lodge of Somerset was created with John Smith, MP for Bath, installed as first Provincial Grand Master at the Bear Inn. A year later in 1769 the fifth Bath Lodge, the Lodge of Virtue number 445, was formed at the Saddlers Arms. 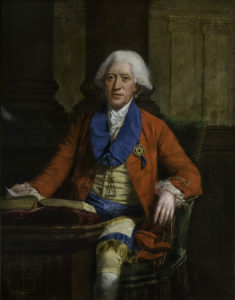 In 1784, Thomas Dunckerley became Provincial Grand Master for Somerset; headquartered in Bath, he was very active in promoting the additional Orders in the county, and in 1782 the first Royal Arch Chapter, the Chapter of Harmony, was formed, being renamed Royal Cumberland Chapter in 1802. Dunckerley was responsible for creating the unique ritual that he presented in 1786 to Royal Cumberland Lodge and the Chapter of Harmony, which is believed to have been the precursor of what became known as ‘Bristol Workings’. That ritual is still conducted by both Royal Cumberland Lodge and Chapter to this day, making a visit to either of them, or the Lodge’s daughter and granddaughter Lodges in Bath, a very interesting evening. In 1790, Dunckerley also collected together several scattered Knights Templar encampments that had formed themselves from different sources over the preceding thirty years, and created the national Grand Conclave of Knights Templar. A minute from Bath in that year states: “William Boyce took all the degrees of ye Red Cross, also Royal Ark Mariners, and many other sections and degrees, having first a dispensation, afterwards a warrant thereby to act.” In 1791 Antiquity Encampment of Knights Templar, which is Number One on the national roll, was formally warranted, although there is clear evidence that it had existed for many years prior to that date. It was certainly part of the Bristol Charter of Compact compiled in 1780. Despite the trevails of the Napoleonic Wars, Freemasonry remained very popular in Bath, and in 1812 a second Antients’ Lodge emerged at the Bladuds Head in Walcot Street. Warranted number 49 on the Antients Roll, it was renumbered when the amalgamation into the United Grand Lodge of England took place the following year. In 1817 it was granted permission by the Grand Master, the Duke of Sussex, to take his name, becoming Royal Sussex Lodge number 69. The following year 1818, it formed its own Royal Arch Chapter, but that lapsed in 1834. There was another flurry of Masonic activity after the creation of UGLE in 1813. 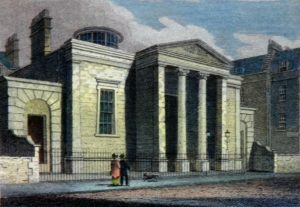 The first Bath Masonic Hall was built in York Street and dedicated in 1819 by the Duke of Sussex. However, the demise of this building as home to Bath Freemasonry just five years later triggered a number of closures. 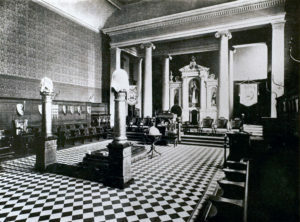 Both the Lodge of Virtue and Lodge of Perfect Friendship folded, along with the Royal York Chapter that had only formed in 1820; Antiquity Encampment of Knights Templar also became dormant. However, this hiatus was fairly short lived, and in 1825 the Lodge of Honour number 528 was formed from the remnants of the two closed Lodges. In 1832 another Royal Arch Chapter, the Tynte Chapter, was formed and in 1834 the second Masonic Hall, located in The Corridor, opened as the home for the three Bath Lodges and two Chapters. In 1852, Bladud Encampment of Knights Templar and St Peter & St Paul Chapter of Rose Croix were formed there, and three years later Antiquity Encampment of Knights Templar was revived, followed in 1857 by the revival of Royal Sussex Chapter. However, in 1861 the Tynte Chapter fell into abeyance, so in 1865 there were active in Bath three Lodges, two Chapters, two Knights’ Templar Encampments, and a Rose Croix Chapter. That was the point at which the rented use of the Corridor rooms had become impractical, and search was conducted once again for a permanent home. A committee was formed chaired by the then Master of Royal Sussex Lodge, John Lum Stothert, also chairman of the well-known local engineering company Stothert & Pitt. They eventually decided on purchasing a disused Catholic Chapel in Orchard Street that had originally been built as the City’s first dedicated theatre. This became the third Bath Masonic Hall, and has been the home of Bath Freemasonry ever since, celebrating its 150th Anniversary in 2016. More details of the history of the building itself can be found on the Old Theatre Royal website. all of whom still hold their regular meetings here. The following year Royal Sussex Chapter No.53 also moved from the Corridor and, in 1874, the Royal Sussex Mark Lodge No.177 was created here to accommodate the revived interest in this Order. The following year Royal Cumberland Mark Lodge also moved to the Hall. One of the five founding Mark Lodges in England who acquired an independent identity in 1856, it had never had a permanent home until this point; it is one of three ‘Time Immemorial’ Orders that meet here. In 1882, Antiquity Encampment No.1 of Knights Templar moved to the Hall, and the associated Antiquity Chapter No.95 of Rose Croix was also revived, further enabling the creation of the Antiquity and Bladud Priory of Knights Hospitaller. In 1890 work commenced on creating a permanent dining room. The primary reason for this work was the arrival of a fourth Lodge, Royal Albert Edward No.906. They had been formed in 1862 as a daughter Lodge of Royal Cumberland, and originally met in Keynsham before moving to the Crown & Anchor in Weston village five years later. Their first meeting in their new home took place in March 1891, and they have been here ever since. 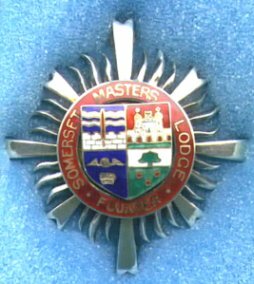 Somerset Masters Lodge was Consecrated in Bath in 1915. This is a research Lodge, open to all Somerset Masons who have attained the Chair of their Lodge and, since its inception, has published the papers presented to it by members in an annual Transactions book. Although always based here in Bath, it is a peripatetic Lodge meeting throughout the Province twice a year. Their Centenary meeting was held at Bath Masonic Hall in 2015, when a new Centenary banner was also presented to them. In 1920, St Alphege Lodge No 4095 was formed as a daughter Lodge of Royal Albert Edward, and therefore a granddaughter of Royal Cumberland. It has always met on a Saturday evening, the original reason being primarily to accommodate the many traders and travelling salesmen who lived in Bath, but found it difficult to attend meetings held during the week. It is now the largest Lodge in Bath, and is also a member of the Universties Scheme. In 1925, the Bath Masonic Museum and Library was created by George Norman. It is the oldest Provincial Masonic Museum in the country, and has always been open to members and visiting guests. The Museum was originally located in a room on the fourth floor of the building, with the library on the floor below, but in 2009 the Museum was moved to the vaults and is now also open to the public as part of the regular guided tours of the building. The Library was relocated to the previous Museum room to enable the extensive collection of Masonic books and periodicals to be better accessible to members. In 1928 Wessex Council No.41 of Royal & Select Masters was created here, where it has met ever since. This Order was originally created in England in 1873, following its introduction into this country from the American variant of Scottish Rite Freemasonry, which itself was ‘imported’ from Scotland during the eighteenth century. So, although the Order is fairly modern, its ritual traces back much further. With the likelihood of war becoming ever nearer during 1939, plans were made to evacuate most of the headquarters departments of the Admiralty to a safe place in the provinces; Bath was chosen as their base. Technical staff were moved from London and the Royal Dockyards at Portsmouth, Devonport, Chatham, Sheerness and Rosyth to form a whole new community in the city. Many of these were already Freemasons and, in 1940, meetings were held at St Luke’s Church Hall with a view to forming an Admiralty Lodge, but these did not meet with favour from Province as all evacuated staff were promised to return to their homes after what was expected to be a short conflict had ended and it was felt the Lodge would inevitably lapse. Instead it was agreed to create the ‘Royal Albert Edward Lodge of Instruction, Admiralty Section’ for ‘Officials of His Majesty’s Services temporarily resident in the City’ held here in the Masonic Hall. 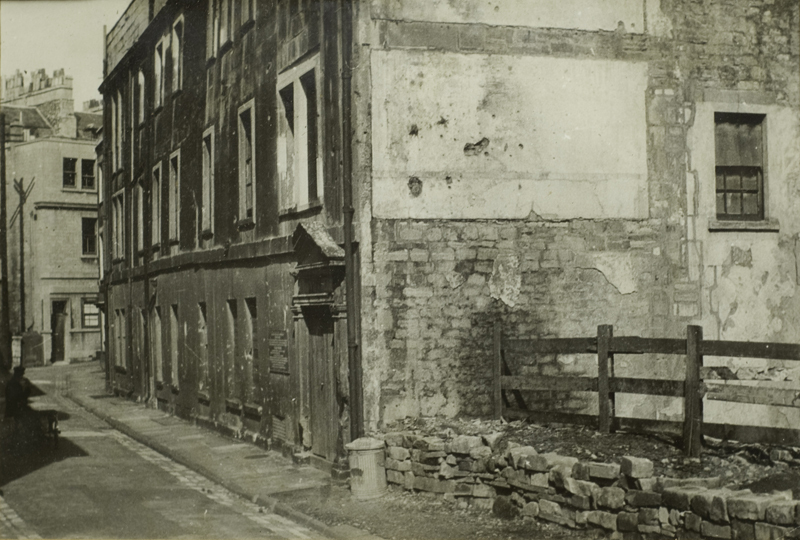 Photo from the 1940s, showing the shrapnel damage and the bombsite where the next door building had stood. In 1942 Bath was subjected to a series of air attacks which were part of what became known as ‘Baedecker Raids’ due to the suggestion that Hitler chose the targets while consulting a copy of the Baedecker Guide to England. During one of these raids, one of the buildings next door received a direct hit, which also severely damaged the southern end of the building as well as the Museum. Some meetings had to be held temporarily at the newly-built Keynsham Masonic Hall while essential repairs were made in Bath but, with these accomplished, normal service was quickly resumed in Orchard Street. The first development after the war, in 1945, was the formal revival of The Bath Royal Ark Mariners Lodge, which has associations with the City going back to the 1790s. Early in 1947 it was announced that the Admiralty would be staying in Bath and St Luke’s Lodge No.6540 was formed by the members of the temporary Lodge of Instruction that had continued to meet since 1940. The new Lodge was named in recognition of St Luke’s church hall having been the original meeting place and St Luke also being the Patron Saint of Sailors. Two years later, in 1949, St Luke’s Chapter No.6540 also joined the expanding roll of Fraternities meeting at Old Orchard Street. Membership of St Luke’s Lodge continued to grow, so in 1953 a daughter Lodge was formed, Elizabethan Lodge No.7296. During 1950, some meetings were again moved to Keynsham to enable full refurbishment of the Bath Temple to be completed, finally restoring the building to its former glory 8 years after the bombing damage was caused. Masonic life here over the next fifty years was very stable, with steady development of all the Lodges and Orders. There were two new arrivals during that time, in 1965 when King Edgar Tabernacle of Knights Templar Priests No.31 was formed here, and in 2008 when the Reginald Fitzjoclyn Chapel of St Thomas of Acon was created. Which brings us to the present day; nearly 300 years after the formation of The Queen’s Head Lodge by 42 gentlemen, mainly visitors to the City, Bath Freemasonry comprises eight Craft Lodges and fourteen associated Orders. Their members are the latest in more than twelve generations of local men of all social backgrounds and professions who have enjoyed each others’ company on a regular basis. 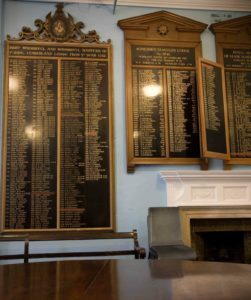 Some of their names are listed on the numerous Honours Boards that adorn the ante room where we all gather before our meetings – familiar local surnames such as Attwood, Phillott, Bateman, Spry, Stothert and Pitt, Fuller, Sparrow, Ireland, Milsom, Cater, Stoffell and Fortt. Many of those gentlemen were also philanthropists who chose to grace this Fraternity with their fellowship, and provide inspiration to their latest counterparts whose association, we hope, will continue for many hundreds of years more into the future. Founded in 1925, The Edward Gaynor Museum is one of the oldest Masonic Museums in the country. 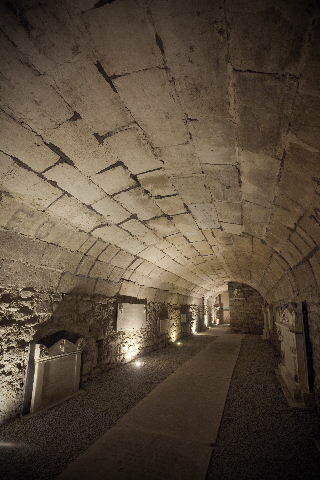 It is housed in the vaults and open to the public on selected days each week as part of the regular Guided Tours around the building. 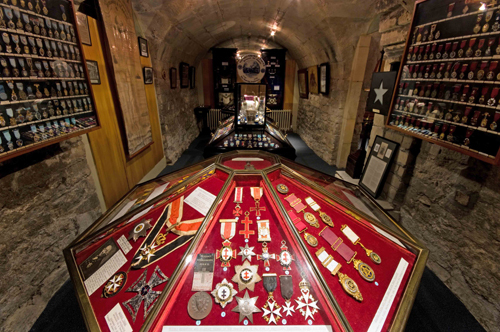 The Museum contains exhibits illustrating the history of Freemasonry in Bath, as well as Masonic Artefacts from England and overseas, some predating the foundation of the first Lodge in Bath in 1724. For more information on the Museum, click on any of the images above or below. The Museum was expanded in 2009 to include exhibits on the history of the building, also known as the Old Theatre Royal, covering the 150 years it has been Bath Masonic Hall, plus its previous usages as a Theatre from 1750 to 1805 and as a Catholic Chapel from 1809 to 1863. For more details on the Guided Tours click the Old Theatre Royal logo below. More than three thousand Freemasons died whilst serving their Country during the First World War. The Grand Lodge building in London was erected in 1927 as a memorial to them.